Leaflet produced in 1971 by US libertarian socialist group Root & Branch. The last few months have been hard times for the government of Poland, as workers organized mass strikes, street demonstrations, and factory takeovers. They fought police sent to drive them back to work, looted government-owned stores, and sacked and burned government office-buildings. What's the meaning of such a breakdown of Law and Order in a country like Poland? Communism is supposed to mean a society run by workers in their interests. The events in Poland show that the people there know as well as we do that what's called "communism" there isn't anything of the sort. The "communist" governments in the world today represent their workers about as much as, say, the GM Board of Directors represents the men and women who work in GM's plants and offices. These government are in fact like big companies as well as governments. In Poland the state owns all productive enterprises (except for small farms) and all stores. Thus it sets all wages and prices. In addition, it controls all public institutions, like newspapers, schools, and even the trade unions. The working people have no say about what they produce, how it's produced, who gets what part of the product, how much time people spend at work and how much time is free. Of course, the people at the top who make all these decisions are only interested in how much profit they can squeeze out of the workers (in the "national interest"). So, since the state is the boss, strikes in Poland are serious political acts, attacks on the government. Strikes are even illegal in Poland. But in any situation where an elite rules the lives of others, the people on the bottom eventually get fed up. In 1956 there were big strikes and demonstrations (as well as in Hungary and East Germany). They were met by repression and some concessions. But Polish "communism" still means overwork, low wages, and nothing to say about it, and this has pushed the people there to rise up once again. The immediate origin of this year's strikes and riots was in the new five-year economic plan drawn up by the Polish government in May, 1970. Responding to workers' on-the-job sabotage through slowdowns and general inefficiency, the plan introduces a system of wage incentives tailored to pushing people to work harder for still lower wages. Workers in the "Lenin" shipyards in the city of Gdansk had been agitating against the new plan since May. A Communist Party official was sent to calm them. On December 13 he spoke at a meeting at the shipyards; instead of answering their complaints he announced that while prices of certain appliances would be reduced, food prices would be raised by 10% to 30%. The government's idea was that reduced food consumption would allow them to export more agricultural goods and develop industrial productio. Since Polish workers spend at least half their wages on food, this didn't exactly calm them down. In fact, the workers called a meeting for the next day to decide on action. Huge numbers of shipyard workers and dockers came to this meeting, joined by university students. The crowd decided to go to the Communist Party headquarters in the city. When police tried to disperse them with water-cannons, they began looting stores. They finally reached the Party HQ and proceeded to burn it down (singing the "International", the traditional song of working-class revolt). Other fires were set in State buildings and Party officials' cars were burned. Many of the demonstrators were armed with lead pipes and chains and the battle with the police was bloody. The workers and students sent people to the nearby towns of Gdynia and Sopot to spread the revolt. In Gdynia demonstrators burned the railroad station and Party HQ. In Warsaw, the capital, the mass media - all government controlled - were silent on the revolt, but the government sent the army and the militia (Party-member goon squads) to the troubled area. The area was sealed off and a. curfew imposed. Demonstrations continued the next day, with police and militia shooting people in Gdansk and Gdynia, killing about 28. On the 16th, faced with the hopelessness of battling the militia in the streets, workers in these towns began occupying their workplaces. That evening, Deputy Premier Kociolek went on the radio to ask the population to go back to work. But, the next morning, when the workers of Gdynia were on their way to work at the shipyards, docks, and factories they were met by heavy machine gun fire. When 2000 of them marched to the town hall to demand an explanation, they were fired on again. The government said that 21 people were killed, but an underground appeal written by shipyard workers in Gdynia claimed that ten times this number of men and women died in the massacre. The same day, in a speech to the nation, the government said that "anarchists, hooligans, and criminals" were responsible for the protests and that "law and order" had to be restored. They also gave orders for the militia to shoot demonstrators—as they had already been doing. But at the same time the rebellion was spreading. In another city, Szczecin, shipyard workers held a meeting in which they decided to support the Gdansk workers and to go to Party HQ to talk with officials. As they left the shipyards they were fired upon by the militia. Nevertheless a crowd of 10,000 moved towards the center of town, writing slogans on walls and the army's tanks : "We are workers, not hooligans !". "We want higher wages and freedom ! ", and "Down with the Party bureaucracy !". The army refused to shoot but militiamen began firing. In response the crowd lynched a militiaman and burned down Party HQ, the union and passport offices, and the homes of some Party officials. They tried to storm police HQ but were stopped by gunfire. Just before nightfall, the workers returned to the shipyards, sitting-in and barricading the gates. Organizing began in order to spread the strike inside and outside the city. During the next five days the strikers in Szczecin largely ran the town, maintaining municipal services and organizing a workers' militia to patrol the factories and the city. Meanwhile the sit-down strikes in Gdansk and Gdynia were growing; strike committees and agitation committees were organized to spread the strike. The strike did spread : to Nova Huta (a big iron and steel complex), parts of Warsaw, and several other industrial cities. In still other cities there was agitation and rioting, and the army was sent to occupy some of them. The Polish—East German border was sealed off by Russian tanks. Nonetheless, agitation and worker support activity seems to have spread to E. Germany, and the German government quickly announced a wage increase. Similar measures to stem the tide of strikes were used in other East European countries and even in Russia. In Warsaw, students were sent home on vacation early to avoid student activity. Having failed to stop the movement with guns and rhetoric about "hoodlums and anarchists" the government tried a different tack. On the 20th, Polish Prime Minister Gomulka was replaced by Edward Gierek. The new government publicly recognized that the demonstrators were workers with grievances and rescinded the decree ordering the militia to shoot. It even admitted that the Party has "lost contact" with the workers (!!!). Finally, it promised that wages would not be reduced and asked the workers to go back to work. But the tanks and militia remained in Szczecin, and there were reports of Russian "technicians" in Polish uniforms. In Gdynia the militia occupied the shipyards to avoid another worker sit-in . The situation remained relatively calm until January 7th when the Gdansk shipyard workers resumed their agitation : demanding that 200 workers imprisoned during the revolt be freed, and that the speed-ups and bad working conditions be ended. In a mass meeting they demanded that Gierek come and talk with them. By January 17th the strike had closed all the shipyards in Gdansk and Szczecin. In Gdansk workers demonstrated in front of the Party HQ to present their demands : immediate freeing of imprisoned fellow workers, and 20% increase in wages, the improvement of working conditions, the end of overtime, improvements in housing and transportation, and freedom of the press (including publication of their demands). The workers refused the government proposal to "work first and make demands later" and stayed out on strike. Again strike and agitation committees were elected. By the 19th the strike had become almost total in Szczecin, and had spread to Gdynia. Mass meetings drew up about 2000 demands, mostly like the ones mentioned above. An important new demand raised by the Palmo automobile workers in Szczecin called for the equalization of the average level of wages in industry with the higher wages of Party members. But perhaps the most serious challenge to the system in Poland was the demand for freedom to organize outside the government-controlled unions, whose main purpose is to discipline the workers and keep production up. Granting this demand would be admitting not only that the unions don't represent the workers but that there is a basic divergence of interest between the workers and the government—something difficult for a state that claims it's a "workers' government" to admit. Naturally, the Party refused to grant this crucial demand, although they did grant some of the others. In fact, from the beginning of the strikes the workers had organized themselves outside the unions, and fairly successfully. An underground network was set up with runners going between factories to keep different groups of workers in direct contact with each other. This network included (or includes, if it still exists) workplaces in Gdansk, Szczecin, Zyardow, Warsaw, Poznan, and Piaga. The workers were able to coordinate strikes. In one city, shipyard workers struck for two hours; when they went back to work streetcar workers went out for two hours; when they returned to work a two-hour strike began in a factory, etc. 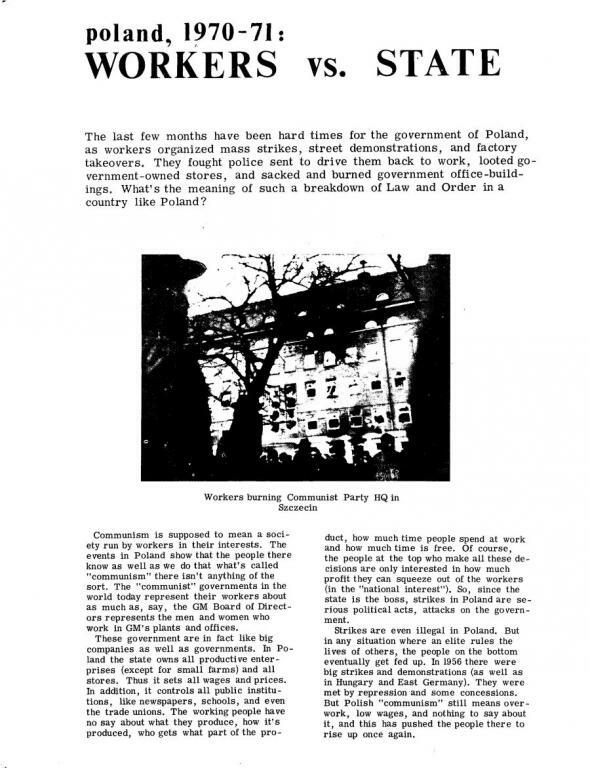 Finally, as the movement continued to spread and the possibility of a general strike all over Poland became real, the government had to recognize the existence of these organizations by negotiating with them. When Gierek came to speak with the shipyard workers in Szczecin he spoke not with the union leaders but with 500 representatives chosen by the workers. It was the same when he went to Gdansk the next day. Gierek promised the workers he would postpone for a year (not abandon) the five- year plan, but refused to raise wages because the state "could not afford it". The Szczecin workers' demand for payment for the days on strike was also granted. The workers returned to work, though agitation continued. On February 13th, in Lodz (Poland's second largest city) 10,000 textile workers, mostly women, started a sit-down strike which crippled the country's textile production. They demanded increased wages and better working conditions. The position of women in Poland is especially bad; they are expected both to work and to do the housework and take care of the children; and their wages average 30% lower than mens'. The Lodz strike led to the government's finally rolling back the food prices, and the strike ended after five days. Poland is quiet now, but no-one can say for how long. Most of the immediate reasons for the trouble are still there, or will be back soon (the five-year plan is supposed to be instituted next year). A week ago workers in Szczecin were complaining that the government's promises of better working conditions weren't being kept. On February 16th, the government announced that it will make no more concessions. What the Polish workers have been fighting can't be explained by using the word "communism"—that word (like "democracy" ) can mean anything you want it to. The problem is the boss. The problem is that the Poles face basically the same kind of system we do : everybody working for a few people who own everything and tell us what to do—fight a war here, take a wage cut there, lose a job here, take a cut in welfare there. Over here the power appears to be all split up between the bosses, politicians, union bureaucrats. And when we strike or demonstrate we're all divided; it's auto workers or truckers, or GE workers—or students. Because of the central role of the state in the Polish system they can see that everybody shares the same struggle against the same small group of people. All workers have the same enemy—the boss, whether he calls his rule “communism” as in Poland or “democracy” as in the U. S.
All workers have the same friends—each other, not the politicians or union officials, out for power and a buck. Only one thing means anything in the long run—action. Not leaders sitting around negotiating tables, but direct action in the factories, offices, schools, and streets. There's no point waiting for good times to come. If we want things different, WE'LL have to make them different. We certainly can: Who does the work? Who fights the wars? Who does it all depend on? THE WORKING PEOPLE HAVE THE POWER. ALL WE HAVE TO DO IS USE IT! For more copies of this leaflet, or if you want to help distribute it, write to: ROOT & BRANCH, P.O. Box 496, Cambridge, Mass. 02139.